SAALT wants to hear from activists and community members about the relevant issues of the day through our blog, the SAALT Spot. For the month of March, we are focusing on the topic of immigration raids and detention and their impact on the South Asian community. You don’t need to be an immigration expert; we are interested in what people throughout the country and community are thinking and talking about. -Immigration enforcement has been on the rise in recent years and include both workplace and residential raids. In fact, a recent raid, the first since President Barack Obama’s inauguration, took place on February 24th in Bellingham, WA, where 28 workers were arrested by Immigration and Customs Enforcement at a engine manufacturing plant. -Immigration raids tear families apart, often separating U.S. citizen children from their immigrant parents. -There are now approximately 400 detention and deportation facilities all around the country (an interactive map can be found here). -A group of the Indian guest workers who allege they were exploited by their employer in the Gulf Coast and are engaged in a struggle for justice were caught up in an immigration workplace raid in North Dakota. 23 workers were arrested during that raid. 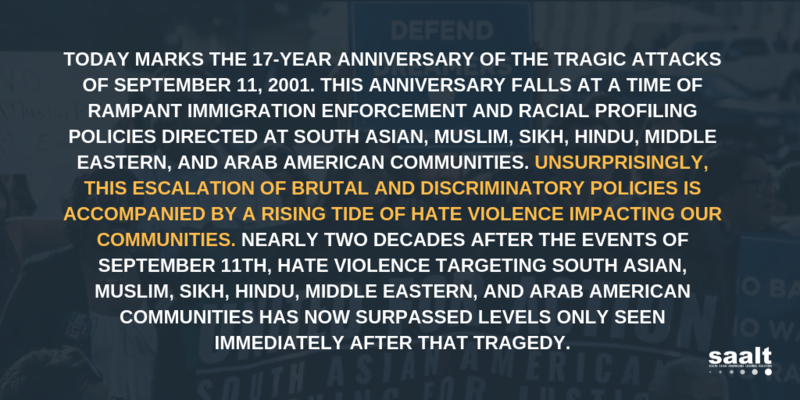 -How have immigration enforcement procedures affected South Asians? -What issues and provisions should South Asians look for in government legislation and policies that address immigration enforcement? -How can the South Asian community make our positions heard around immigration enforcement policies? Ideally, blog posts will be between 1-3 paragraphs and each guest-blogger will write 2-3 entries in the course of the month. If you want to link to interesting articles or blog posts, please include them in the text of the composition. All entries should be emailed to mou@saalt.org on the Tuesday of each week in February that you can contribute. Entries may be edited for length.